Sometimes a recognizable form is suggested when a static optical entity is produced. In this case, three reactors were trained on a white stretched canvas, and daylight filled the room from an open window. Where the fields intersected, a texture was formed that resembled, to me at least, the scales on the side of a fish. Just as acoustic resonance is characterized by the geometry of the space in which the sound energy is encapsulated, the shape and reflective properties of the projection surface can cause resonances to occur in an optical reaction as well. The effects of optical resonance are more pronounced on irregular projection surfaces, for example the contours of skin covering the human form. Under precisely controlled conditions, resonance patterns can be generated for every individual that are as unique as fingerprints, based on the distinctive geometry of an individual body’s structure and qualities of dermal reflection. The changes these unique geometric forms take while the person is in motion — dancing, talking, even breathing calmly — adds yet another dimension to the visual “reverberation chamber” that is each person’s vessel in life. The phrase “locally coincident contrary motion” refers to the tendency for graphic entities to move in two different directions at the same time and in the same area. An example of this phenomenon might be a reaction that appears to spiral to the left while contracting, yet is paradoxically also exhibiting characteristics of turning to the right and expanding. This effect is caused by the delay which occurs during one entire traversal of signal from camera to data cable to projector and back to the camera, called the “reaction cycle time.” The accumulated delays between components can take so long that two separate reactions can be interleaved, giving the impression of motion in two directions. While scientific tools could be brought to service in the analysis of how a generalized patch of skin reacts to light, there may be little practical use for such detailed information. Given the wide variety of colors, textures, and reflective properties that are found between individuals of the human race, and even on adjacent parts of the body of any one person, it seems more reasonable to learn how to use the various qualities of skin reflection and refraction to achieve a particular aesthetic effect within the narrow context presented by an individual performer. This analysis only pertains to skin in its natural state, without modification or the application of any substance such as paint or makeup, or even water. A “reactive color field” is any optical reaction that can be described as a wash of related colors over major portions of the projection surface; a color field is distinguished from a more typical graphical display by the relative lack of areas of high contrast. Mutable color fields can either cycle through the spectrum of colors repeatedly or transition directly to a less dynamic state, such as a solid color or total darkness. Color field stasis is a condition that is stable but not necessarily locked into such end-point conditions without any means of escape. In some cases, a properly balanced color field will present one or more static color “wells” that can be gently influenced by changing certain properties of the optical reactor’s registration. “Optical striation” describes a wide variety of graphical behaviors characterized by the visual form of elongated light and dark strands on any projection surface. 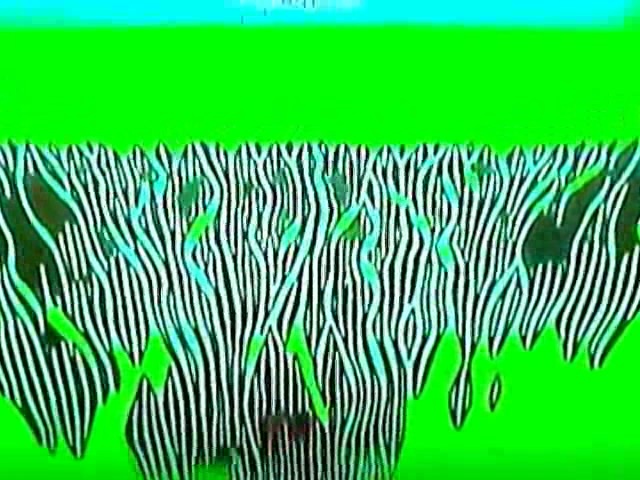 In some cases, these effects are due to slight irregularities of the surface, but there are also situations in which emergent linear patterns are generated from other sources, including the video camera, projector, and the way in which data is digitally packaged and transmitted between them. Control of striation requires an understanding of the conditions that are most optimal for the effects to occur, and the element of improvisation cannot be underemphasized, because the act of harnessing optical reactions often requires split-second decision making ability both behind and in front of the reaction systems while a graphical sequence unfolds. When a certain balance point was obtained, a remarkable blending of color fields and striations occurred. At times, the lines widened, forming what appeared more like ribbons of color, unlike the thinner strands that were common in past sessions. The blend of purples and greens is particularly striking to me.